We exploit time diary data for couple households in Denmark and the United States to examine the impact alternative measures of intrahousehold bargaining power have upon different measures of individual time use. Power measures have traditionally been based on current earnings, but earnings are determined by past/present time use decisions and hence potentially endogenous. 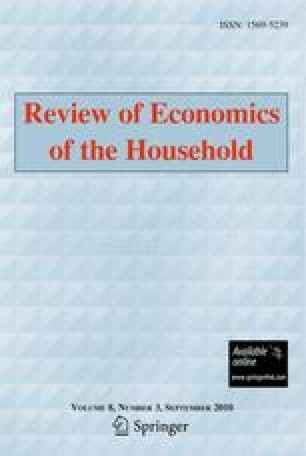 More powerful individuals have been hypothesized to spend less time on housework, however, housework time also depends upon relative preferences for home produced goods and relative productivity in home production. Gendered notions of time use and censored earnings and time data also pose problems. We propose examining leisure time and exploring alternative measures of power less prone to endogeneity bias in order to address these theoretical and empirical concerns. Our results indicate that leisure time is more consistently and significantly associated with ‘power’ than housework time and that education share performs quite well as a measure of power. These results are particularly strong on non-work days and in the United States. We are grateful to Camilla Østerballe Pedersen and Philip Røpcke for very helpful research assistance. We gratefully acknowledge financial support from the Danish Social Research Council, FSE, and comments from referees and participants at the Workshop on the Labour Market Behavior of Couples held in Nice, France June 2008.